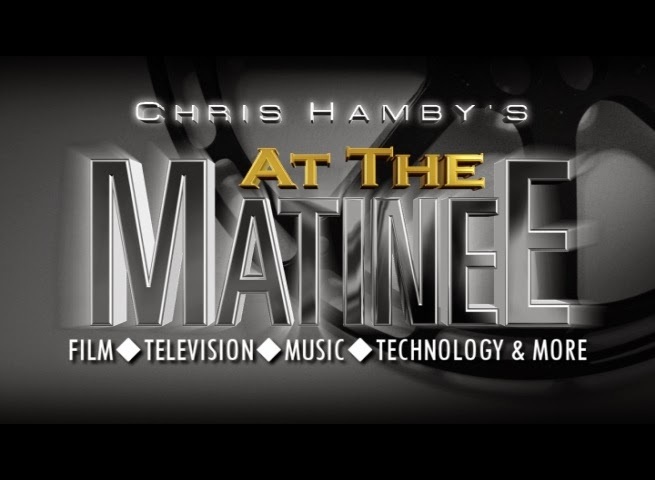 Chris Hamby Presents "At The Matinee"
A cameo mention to fellow Svengoolie SvenPal Jamie Lee for encouraging me to spread the word about this. -C.H. 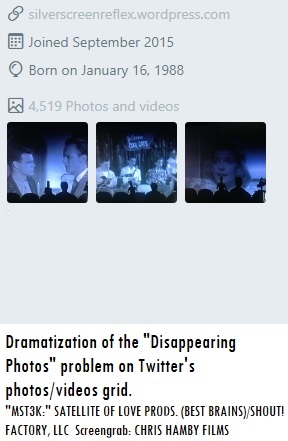 Recently, several fellow SvenPals and I have discovered something unusual in the "photos/videos" grid, which is usually made up of six recent photographs or video files on the profile page. When one clicks on one of the six photos (or video files) in the grid on the profile page, an enlarged view of the photographic (or filmed) content timeline can be seen. Yet for reasons unknown, the regular photo timeline stops at a certain point (a certain number of photographs/visual content) when one wants to go back through the entire photo timeline chain to search for a certain photo that was previously uploaded (depending on the amount of photos that were taken). It might also depend on one's operating system setup and browser (results may vary). Other multimedia-based tweet entries (YouTube/Vimeo videos, etc.) might be one of the causes of this. That does not mean that all of the past photos/videos are are missing, many past Twitter multimemedia (photos and videos) tweets can be found on the "media" tab on one's Twitter profile page. Twitter's tech support has not been helpful in this area of timeline/slideshow photo problems in the "photos/videos" grid. For fellow users who are experiencing this sort of problem, there are some methods to retrieve older multimedia/photographic-based tweets. 1. Go to the "search" icon box and type in the subject of your choice with the use of hashtags (for example: "#Svengoolie"). Then, press enter. 2. Go to the "Search Filters" window on the left-hand side of the screen after typing in your search subject with hashtags. Click on "show" to open the entire window pane. 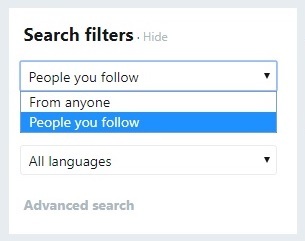 Make sure the top drop-down menu in the "Search Filters" window is set to "people you follow." That way, you will be able to see your own posts in addition to your fellow followers' posts within that search category. You can also go click on "advanced search" filter specific search settings for certain photos (with specific phrases, hashtags and/or desired time frames). 3. Another possible step would be to bookmark the desired (older) photographic/video file-based tweet on your browser. 1. Click on your Twitter "profile photo" icon. On the drop-down menu list, click on "Settings and Privacy." 2. On the "Settings and Privacy" page, scroll down to the bottom of the page and click on "Request your Archive" (under the "content" header). An e-mail message to a link for the file (Twitter archive) will be sent to your primary e-mail address by request. To any fellow Twitter followers or experts who know any tips/tricks for navigating older photos on the photo timeline (in relation to the "disappearing photos" problem from the photos/video grid), feel free to comment on here or on my film-oriented blog, "Silver Screen Reflections." -C.H. 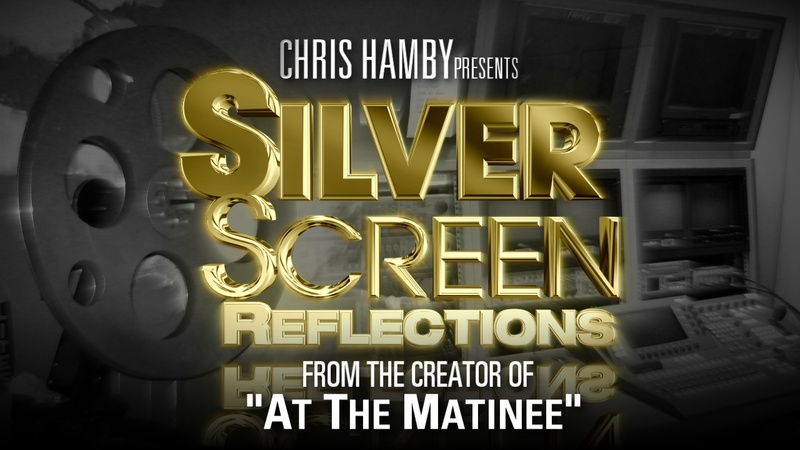 For all the latest posts related to classic/cult cinema and Svengoolie, visit my "Silver Screen Reflections" blog on WordPress! A Re-Post from my other classic cinema blog, "Silver Screen Reflections." Fans of classic and cult cinema in the area will be excited about another vintage film series that will return to the Gettysburg area. The historic Majestic Theater in Gettysburg, Pennsylvania will be bringing back a series of vintage and cult motion pictures for the summer. The theater’s “2016 Summer Classic Movies” series will be presented every Wednesday evening* at 7:30 p.m., beginning on June 1 and will end on Aug. 24. The ticket price for each movie is $6 per person. Each film presentation will have a special introduction by Jeffrey Gabel, area movie buff and founding executive director of The Majestic. In addition to the screening of films, a special raffle prize giveaway will also occur. June 1: “Brigadoon” (1954), directed by Vincente Minnelli, featuring Gene Kelly, Cyd Charisse, Van Johnson and Elaine Stewart. MGM screen adaptation of the Lerner and Lowe Broadway musical (presented in its original CinemaScope aspect ratio and in AnscoColor). June 8: “The Palm Beach Story” (1942), Written and directed by Preston Sturges, featuring Claudette Colbert, Joel McCrea, William Demarest, Mary Astor and Rudy Vallee. June 15: “Back to the Future” (1985) directed by Robert Zemeckis, featuring Michael J. Fox, Christopher Lloyd, Caroline Rea, Wendie Jo Sperber, Crispin Glover and Thomas F. Wilson. Winner of an Academy Award for Best Special Effects Sound Editing (Charles L. Campbell and Robert Rutledge). June 22: “The Prince and the Pauper” (1937), directed by William Keighley, featuring Errol Flynn, Claude Rains, Phyllis Barry, Barton MacLane and Henry Stephenson. 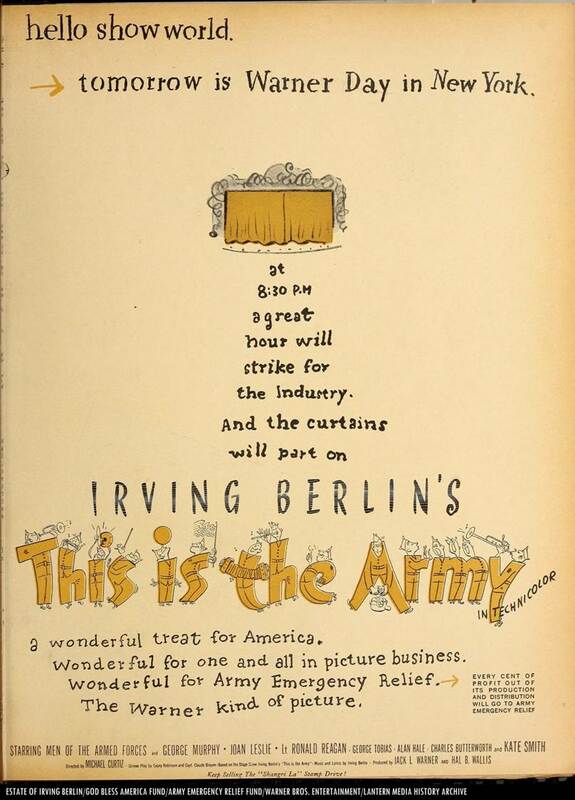 1943 Warner Bros. trade ad for "This Is The Army." June 29: “This Is the Army” (1943), directed by Michael Curtiz, featuring Irving Berlin, Ronald Reagan, Joan Leslie, George Murphy, Kate Smith, George Tobias, Dolores Costello, Una Merkel, Alan Hale and Charles Butterworth. Based on Irving Berlin’s musical, Winner of an Academy Award for Best Score (Leo F. Forbstein and Ray Heindorf). July 6: “Jaws” (1975), directed by Steven Spielberg, featuring Richard Dreyfuss, Roy Scheider, Lorraine Gary and Robert Shaw. Winner of three Academy Awards, including Best Sound (Robert L. Hoyt, John R. Carter, Roger Herman, Jr., Earl Madery), Original Score (John Williams) and Best Film Editing (Verna Fields). Recognized as one of the first major “summer blockbuster” films. July 13: “High Noon” (1952), directed by Fred Zinnemann, featuring Gary Cooper, Grace Kelly, Lloyd Bridges, Lon Chaney, Jr.; Lee Van Cleef, Henry Morgan and Jack Elam. Winner of four Academy Awards, including Best Actor (Cooper), Best Score (Dimitri Tiomkin), Best Song (“Do Not Forsake Me,” written by Tiomkin and Ned Washington, sung by Tex Ritter) and Best Editing (Harry Gerstad and Elmo Williams). *July 20: No film is scheduled for that evening, music group “St. Paul & The Broken Bones” will appear on the Majestic stage. July 27: “Harvey” (1950), directed by Henry Koster, featuring James Stewart, Josephine Hull, Peggy Dow and Charles Drake. Hull won the Academy Award for Best Actress. Aug. 3: “Goldfinger” (1964), directed by Guy Hamilton, featuring Sean Connery, Gert Fröbe, Honor Blackman, Shirley Eaton and Burt Kwouk. Winner of an Academy Award for Best Sound Effects (Norman Wantsall). The third film in the 007 franchise, based off of Ian Fleming’s seventh novel in the James Bond series. Aug. 10: “Star Trek II: The Wrath of Khan” (1982), directed by Nicolas Meyer, featuring William Shatner, Leonard Nimoy, Nichelle Nichols, George Takei, DeForest Kelley, James Doohan, Walter Koenig, Ricardo Montalban and Paul Winfield. Perfect for fellow Trekkies and fans of science fiction. Aug. 17: “Goodbye, Mr. Chips” (1939), directed by Sam Wood, featuring Robert Donat, Greer Garson, Paul Henreid (then known as Paul Von Hernried) and John Mills. Donat won the Academy Award for Best Actor. Aug. 23 (Finale): “The Band Wagon” (1953), directed by Vincente Minnelli, featuring Fred Astaire, Cyd Charisse, Oscar Levant, Nanette Fabray and Jack Buchannan. The iconic song “That’s Entertainment” was introduced in this classic cinema musical and was later used as the title for the popular MGM retrospective trilogy series, “That’s Entertainment!” (1974, 1976 and 1994). The Majestic’s summer classic/cult movie series has something for everyone, from Hollywood classics to iconic cult feature films. So kick back, relax and enjoy a classic film in one of the “grandest small-town theaters in America.” You won’t be disappointed! 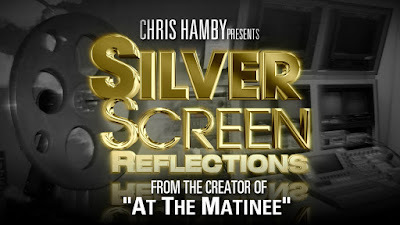 A re-post from "Silver Screen Reflections." In honor of tomorrow’s “Record Store Day” event, here is this 1958 RCA promotional film on “Living Stereo,” produced by The Jam Handy Organization (and is available at the Internet Archive). Even though this film is not available in stereo (this film has a monaural soundtrack) , this was a demonstration film sent to company dealers and distributors to promote the firm’s then-current line of stereophonic “Victrola” consoles, LP albums and 45 RPM stereo discs. Television Corner: Bill Patschak to appear on "Jeopardy!" A fellow alum from Walkersville High School will make his way as a contestant onto another one of the nation’s most popular television game shows. Bill Patschak, a familiar face to the trivia circuit in the Frederick area, will be one of three contestants on “Jeopardy!” His appearance on the Alex Trebek-hosted trivia game show was taped earlier in the year. This will be Patschak’s second national game show television appearance. Patschak was one of many contestant hopefuls chosen by the producers of the show, by completing the scheduled “Jeopardy!” online contestant test. Patschak is no stranger to television game shows. In Jan. 2013, he made his national television game show debut on the syndicated version of “Who Wants to Be a Millionaire?” with then-host Meredith Vieira. His fellow friends in the local trivia circuit have also appeared on the aforementioned game show, Chad Bartholomew in Aug. 2012 and David Gould in Nov. 2012. Patschak was mentioned in an article on local trivia night tournaments in the Nov. 2015 edition of Frederick Magazine. Be sure to watch Bill Patschak’s appearance on “Jeopardy!” It will air this Wed. at 7:30 p.m. on WJLA-TV 7 (in the Washington, D.C. /Frederick, Maryland area). Labels: Alex Trebek, Bill Patschak, Chad Bartholomew, David Gould, Frederick, Game Shows, Jeopardy!, Johnny Gilbert, Maryland, Meredith Vieira, Merv Griffin, Walkersville High School, Who Wants To Be A Millionaire? A re-post from my other classic film blog, "Silver Screen Reflections." 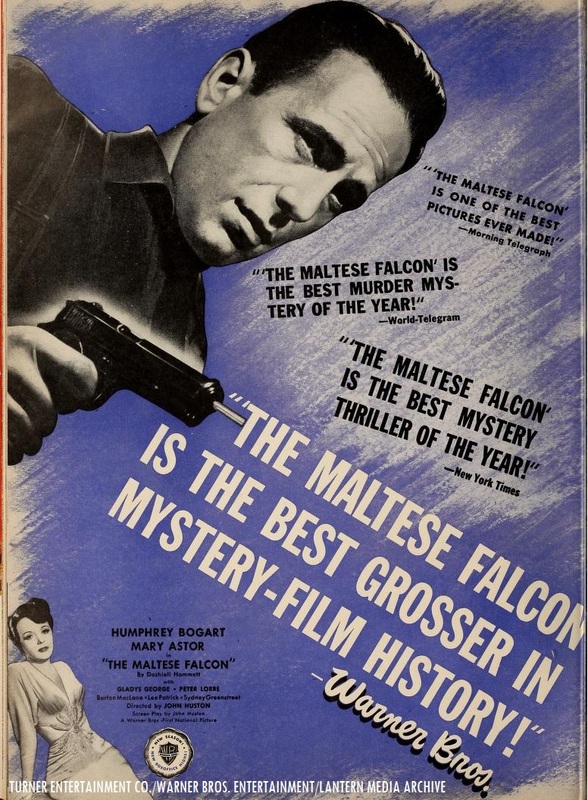 1941 Warner Bros. trade ad for "The Maltese Falcon,"
featuring Humphrey Bogart and Mary Astor. Turner Classic Movies, in conjunction with Warner Bros. Pictures and NCM Fathom Events will showcase the film in select cinema venues from coast-to-coast for one day only on Sunday, Feb. 21 and Wednesday, Feb. 24. “The Maltese Falcon” will be shown at 2 p.m. and 7 p.m. (Eastern) on that day. A special pre-recorded introduction by TCM host Ben Mankiewicz will be shown before the film. With an all-star cast, featuring Humphrey Bogart, Peter Lorre, Mary Astor, Sydney Greenstreet, Ward Bond and Barton MacLane, John Huston’s film adaptation of Dashiell Hammett’s novel is one of the definitive classics of the silver screen. Before Huston’s landmark film was released, Warners made two film adaptations of Dashiell Hammett’s novel. The first screen adaptation of “The Maltese Falcon” was released as a pre-code feature in 1931, featuring Ricardo Cortez and Bebe Daniels. In addition to the three motion picture adaptations of Hammett’s novel, a comedic spoof of “The Maltese Falcon” was produced by George Segal and Ray Stark in 1975, under the title of “The Black Bird.” Directed by David Giler, the film featured Segal (who also played the lead role of Sam Spade Jr.), Stéphane Audran, Lionel Stander, Elisha Cook Jr. and Vic Tayback. If you’re going to see it on the big screen on Feb. 21 (or the upcoming TCM broadcast on Feb. 19), “The Maltese Falcon” is one of the definitive film noir classics. You will not be disappointed by 100 minutes of suspense and intrigue. Highly recommended! SIDEBAR: Yet once again, the Frederick area will miss out on the revival screening of “The Maltese Falcon” (according to the NCM Fathom list of cinema venues from coast-to-coast that will be showing the film). “The Maltese Falcon” will be shown two days before the 75th anniversary screening on Turner Classic Movies, beginning on Friday, Feb. 19 at 11 a.m. Eastern. Take the "Matinee Poll:" Do you think the Frederick area will miss out on the revival screening of "The Maltese Falcon" (even though it was shown in the Frederick area 75 years ago)? A recent change has been made to an upcoming major classic film screening at the Majestic Theater in Gettysburg, Pennsylvania. The Feb. 13 revival screening of the 1942 classic, “Casablanca,” with special guest Robert Osborne (of Turner Classic Movies) has been cancelled. According to a recent press release from the theater, Osborne informed the management of the Majestic that he is in the hospital and is undergoing treatment for pneumonia. Osborne, a noted film critic and longtime TCM host (since the network’s launch in 1994), was originally slated to make a special guest appearance on stage at the Majestic, before the cinema’s screening of “Casablanca” (alongside Jeffrey W. Gabel, founding executive director of the theater). The cinema is honoring ticket refunds. The writer of “At the Matinee” and “Silver Screen Reflections” wishes Robert Osborne a speedy recovery and is hopeful that he will reschedule his appearance at the Majestic in the near future.